The Aztecs had a profound passion for flowers and the Aztec city of Tenochtitlan was also popularly known as the city of gardens. Aztecs used flowers as symbols for a wide range of subjects, including gods, warfare and passions. Mentions of flowers are found in many extant Aztec poetic sources where flowers are often associated with peace. Although commoners could also grow flowers in the Aztec society, nobility were the primary curators of flowers and gardens. Considerable sums were expended by the elite of Tenochtitlan to set up their flower gardens, which was a way of showing the superiority of social rank as well. The Aztec city of Tenochtitlan had many flower gardens. Flower gardens were grown in courtyards, on roofs and in vast fields. Specifically, the nobility considered creating and curating gardens a pleasurable hobby. In this, they were helped and accompanied by expert gardeners. Extant historical sources reveal that the rulers and nobility of the Tenochtitlan city had lush-green gardens with a rich variety of flowers at the time of the Spanish conquest. So treasured were these gardens that waterways were made all the way to the homes of the nobility so that they could easily water their plants. The Aztecs had a profound passion for flowers and the Aztec city of Tenochtitlan was also popularly known as the city of gardens. Flowers are a recurring motif in different forms of Aztec art. Flowers carved in stone were commonly used on the walls of Aztec temples and in the constructions of nobility’s palaces. In many extant Aztec poetry fragments, flowers are passionately eulogised by the poets. In one of these fragments, for instance, a poet speaks about more than a dozen ways in which he treats the flowers, by making different things out of them, by utilising them to different means and by making decorative things from them. Another Aztec poet deemed flowers as among the only true things on Earth, besides music. Aztecs passionately created and curated their flower gardens. The region of Tenochtitlan and Mexico at large was naturally conducive to the growth of various kinds of flowers. Building on this, Aztecs brought many innovations to horticulture which enabled them to modify different varieties of flowers. For instance, Aztecs were able to grow double-flowered marigolds and dahlias which was a significant innovation in the normal varieties of these flowers. Dahlias are today known all over Europe but the first acquaintance of the Europeans with the dahlias was during Hernan Cortes’ visit to the Aztec Empire. 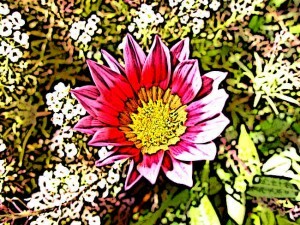 During this visit which led to the conquest of the Empire, Cortes saw a Tree Dahlia variety of this flower. He then had this species brought back to the Continent along with several other plants he saw at Mesoamerica. The Aztecs had discovered Tree Dahlia during their hunting expeditions and considered it a useful plant. They used the stalks of Tree Dahlia as water-containers as well as a source of water. In view of its favourable properties, the Aztecs cultivated Tree Dahlia in their gardens. At Texcoco were located the hilltop gardens which had been built by the ruler of this city, Netzahualcoyotl. He was a poet who decided to establish beautiful gardens at the top of the hills. To do so, he build huge walls of stone which were used to support the aqueducts bringing water to the top. In these gardens, he planted a large variety of trees and plants. These were complemented with bathing places and fountains for the adornment of the gardens. Remains of these gardens are still visible at the extant ruins of the Texcoco city. These are yet another piece of evidence of the Aztec passion for gardens and flowers. Dahlias are today known all over Europe but the first acquaintance of the Europeans with the dahlias was during Hernan Cortes’ visit to the Aztec Empire. Inspired by the example of Netzahualcoyotl, Moctezuma I who was the ruler of Tenochtitlan and the Emperor of the Aztecs, decided to establish his own gardens. For this purpose, he chose the site of Huaxtepec. He had plants brought from all over the Empire to be planted at these gardens. According to historical sources, he demanded tribute of plants from different regions so that the plants brought to him were still wrapped in dirt and directly planted into the gardens. Later, his grandson Moctezuma II looked after these gardens and at the time of the Spanish conquest in the 16th century, these gardens spanned over an area of 7 miles, with more than 2000 species of plants growing inside them. Vanilla was a favourite flower among the Aztecs, both for its beautiful shape and for its lovely scent. Aztecs called it black flower because its pods were black. The vanilla flower originally grew in the warm and moist regions of the Mexico region. It was plucked from these regions and planted in the gardens of Aztec Empires and rulers where it was highly appreciated for its scent and looks. Another famous flower species that was native to the Aztec region was called the “Serpent-head flower”. This name was on account of the shape of the flower which resembled a serpent’s head. Aztecs considered this flower as sacred and believed that it possesed magical properties. It was eagerly grown in the flower gardens of the Aztecs. 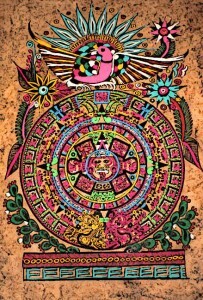 Aztecs were very fond of flowers and expressed a genuine passion for them. A testimony to this are the numerous mentions of flowers in extant Aztec poetry fragments as well as the stone engraving of flowers on the walls of temples and palaces in Aztec ruins. The Mexico region is naturally home to many unique varieties of plants and flowers due to it’s climate, so the Aztecs were able to get their hands on many different kinds of flowers. They celebrated this by establishing gardens at their homes and near their cities where many varieties of flowers were grown. Most notable of these gardens were the hilltop gardens of the Texcoco city and the huge Moctezuma’s gardens situated near Tenochtitlan city. Many varieties of flowers which are today quite popular in Europe were first discovered in Aztec regions and brought after Cortes’ campaign to Spain and to Europe at large.